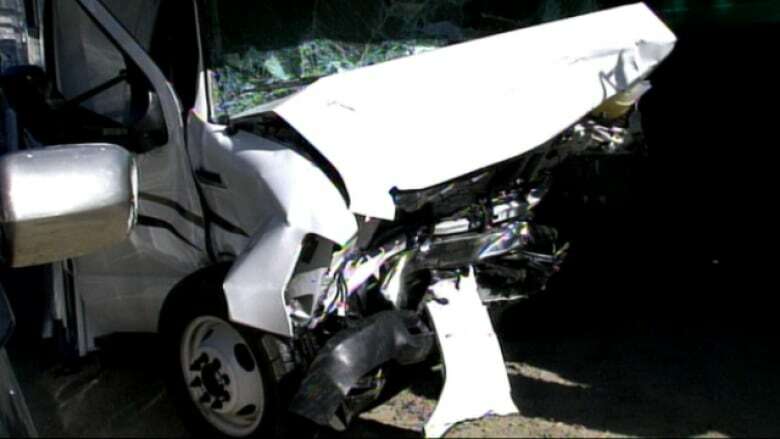 Four tourists were killed on Highway 93 south of Jasper Wednesday evening when a car collided head-on with a motorhome. This is only the latest in a series of fatal crashes on Alberta's highways. Four tourists were killed on Alberta's scenic Highway 93 south of Jasper on Wednesday evening when a car collided head-on with a motorhome, bringing the death toll on the province's highways since July 1 to 19. All three family members inside the car — a 47-year-old man, a 42-year-old woman and their 15-year-old son — died in the crash. A 79-year-old woman who was a passenger in the motorhome was also killed. Her husband was airlifted by STARS air ambulance to an Edmonton hospital, where he is listed in serious condition. The RCMP said neither family was from Canada, but would not release their nationalities until family members in their home countries can be notified. The crash happened about 25 kilometres south of Jasper in Jasper National Park, on stretch of Rocky Mountains highway known as the Icefields Parkway. The highway was shut down for nine hours while emergency crews worked and an RCMP traffic analyst examined the scene. The highway has now reopened. The Jasper collision is the most recent in a series of fatal crashes on Alberta highways this month. According to notices issued by the RCMP, 19 people have died on highways in the province in July. Don Szarko with the Alberta Motor Association is worried about this statistic. "It is disturbing that we've seen these many crashes," he said. "We hope this trend doesn't continue throughout the summer." RCMP Cpl. Darrin Turnbull says there is often a spike in fatal crashes over the summer months, mostly because good road conditions make drivers overconfident and drive too fast. "We have people on our highways who are not familiar with the highway," he said. "Sometimes these people make sudden and unexpected moves. You've got to be paying attention." July 2: A 35-year-old man from Fort McMurray was killed when his truck hit the centre median and rolled near Lavoy, Alta. July 3: A 78-year-old man died when his car collided head-on with another car on Highway 43 in the Sturgeon Lake Cree Nation Reserve. A 62-year-old woman in other other car was taken to hospital with non-life-threatening injuries. July 5: A motorcyclist was killed after trying to pass a truck that was making a left-hand turn. The motorcycle hit the truck and was sent into the ditch along High 697 near Fort Vermilion. July 5: A single-vehicle rollover along Highway 39 in Leduc County killed one person. July 7: One man died on scene after his vehicle collided head-on with another along Highway 770 in Spruce Grove/Stony Plain. The driver of the second vehicle was sent to hospital with unknown injuries. July 7: A van drove into the path of a Harley Davidson motorcycle at the intersection of Highway 2 and 370th Avenue near Okotoks. The motorcycle driver was not able to avoid collision and died on scene. July 8: Two people were killed in a single vehicle rollover on Highway 1 near Chestermere. July 8: A 71-year-old woman was killed and a 34-year-old man sent to hospital after the car they were in hit the ditch and rolled along Highway 16 near Evansburg. July 8: A 65-year-old man and 63-year-old woman from B.C. were killed when their car collided with a gravel truck and trailer at the intersection of Highway 13 and 47th Street in Wetaskiwin, south of Edmonton. July 9: One driver was killed and the other sent to hospital with critical injuries after an SUV collided with a gravel truck south of Irricana on Highway 9. July 9: Two people were sent to hospital after a car ran a stop sign on Highway 779 in Spruce Grove/Stony Plain, colliding with another car. One of the drivers died in hospital; the other has non-life-threatening injuries. July 9: A male driver's pickup truck crossed the centre line of Highway 845 and collided with an oncoming semi-trailer near Coaldale. The man was taken to hospital in Lethbridge, where he later died. His passenger was injured and also taken to hospital. The driver of the semi was not hurt.